Owners of log homes sometimes mistakenly blame insects for damage caused by wood rot. Rotting logs are what usually first attract a wide variety of bugs to your home. Carpenter bees and termites are some of the worst culprits when it comes to the damage done to log homes by insects. Carpenter Bees look somewhat like bumble bees and may construct nests in log homes. A round hole is chewed in the wood surface then a tunnel is bored, usually at 90 degrees to the entrance. The tunnels may be used year after year and lengthened each year. Damage is caused by this repeated use of the wood, which may weaken it directly or cause damage by allowing water to penetrate the log. These nests attract wood peckers which can cause further damage. Termites are small insects that live in colonies in the soil or in wood. Termites eat wood. 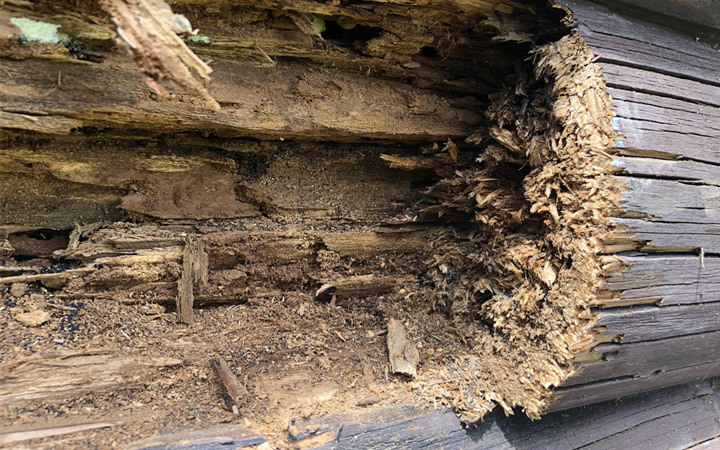 Termites convert wood fiber, or cellulose, into sugar and over time a large termite colony can do extensive damage to structures made of wood. Since termites often consume wood from the inside out, internally damaged wood can appear normal. Termites are probably less of a problem in log homes than in stick frame conventional homes. Long Horned Beetles are sometimes called round-headed wood borers. Long horned beetles generally only infest fresh wood and will not re-infest the wood from which they emerge, which limits their potential for damage. Log damage is limited to large bore tunnels and circular to slightly oval exit holes, which should be filled with caulk to repair. Generally no insecticide treatment is needed. Flat-Headed Borers belong to the beetle family Buprestidae. Adult beetles are sometimes called metallic wood borers because of their coloration. The larvae are similar to long horned beetle larvae except that the area behind the head is somewhat flattened. Like long horned beetles these wood borers do not re-infest and thus their potential for damage is limited. Exit holes are flattened oval in shape. Powder-post Beetles are the only wood borers that commonly re-infest dry, seasoned wood and can do long term damage. The powder-post beetles that infest softwood timbers are usually in the family Anobiidae (anobiid powder-post beetles). Performance Log Finishers experts can treat and fill holes created by wood-boring insects anywhere in your log home. Before using protective log home stains and sealants, we spray logs with a gentle borate treatment that is designed to soak into the logs and protect them against insects and wood rot. After the borate treatment is dry, Performance Log Finishers can offer additional protection against insects and rot by using specialized stains and sealants. Call 800-781-2551 to contact Performance Log Finishers to learn how we can help you protect your home against insect damage. If your home is already in need of repair we will assess the problems and advise you on the best course of action to repair damage caused by such pests.